Lua is a lightweight programming language usually used to extend other programs. In this case, I use lua in emulators to add new functionality to games. This script is intended to make the game a little more challenging and fun. 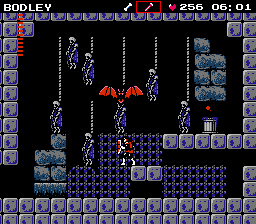 Some enemies are modified, but the main feature is adding guest enemies. 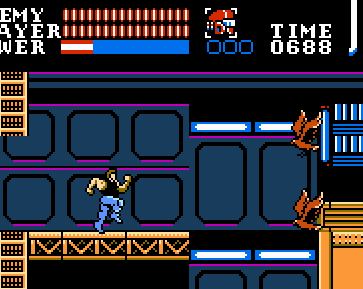 At the moment, you can add the eagles from ninja gaiden and the flying shells from megaman. The guest enemy positions can be saved and loaded with the script. Currently you will have to add them yourself, but I'd like to save several modification files in the future. This script is designed to improve some of the control issues, as well as other issues. 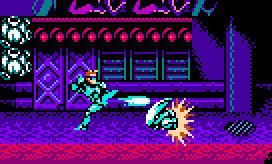 This script lets the player select a rocket pack instead of the Bionic Arm. I've fixed a number of issues, but there may be some bugs, especially with the jump option. Instant in-game character switching by pressing select. — distorted graphics, wrong palette. — * Some things may not change when switching, like root holding position . — only possible on the ground, or have switching cancel a jump. and attempts to print the romanized text to the console. — * Change dagger to Banshee Boomerang. — * Fixed spelling "Prossess" -> "Possess"
— * GUI elements for hearts, sp weapon, time, location. — It simply creates holy fire where the projectile was. — such as moving platforms. — * Banshee Boomerang sometimes disappears unexpectedly. — Seems to happen when scrolled to or away from the bottom.